Military blazers and jackets have been around for some time, and every year they make a comeback! This jacket is a perfect wardrobe staple as it combines a blazer style with military style that is totally unique, and it is also incredibly stylish and a great way of giving your style a boost this season! This design features a lovely soft fabric that is super comfortable to wear, it is cut to fit and accentuate a woman’s shape beautifully, and the length is ideal for the most flattering results! 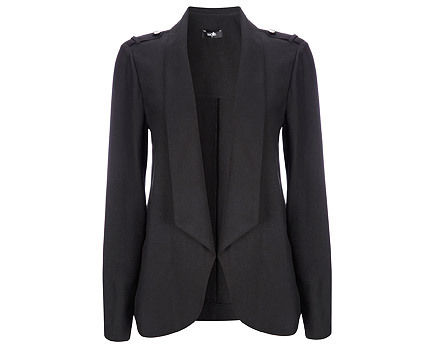 The long collar feature makes a statement to the front of this jacket and is super sophisticated, whilst the shoulder cuffs and buttons add just the right amount of edginess. Team this jacket with skinny jeans and ankle boots for a statement look this season, or try wet look leggings for a totally hot look that is so cool right now. It will also team nicely with skirts and dresses!